Josue Posada is a premier client advisor for Matthews Multifamily Advisors™, a division of Matthews Real Estate Investment Services™. As a trusted advisor, Josue focuses on the acquisition and disposition of multifamily assets nationwide, more specifically in San Antonio and South/Central, Texas. Josue works with a wide client base, from private investors to institutional firms, and is constantly working to exceed his clients’ investment goals. Josue redefines expectations through unwavering loyalty and commitment to the interests of his clients, resulting in an unparalleled agency experience. Prior to joining Matthews™, Josue was a Banker at University Federal Credit Union (UFCU) where he managed new account openings, executed loan originations for various products, performed regular account maintenance and oversaw the overall relationship building with members of the credit union. Additionally, Josue translated multiple member interactions including, but not limited to; insurance quotes, loan origination, account services, and general financing knowledge. 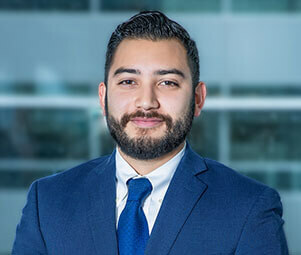 During his time at UFCU Josue expanded relationships with the credit unions and maximized his clients overall financial standing while also advising on general advantages and disadvantages on various banking products in a clear and concise manner.